Mountains of tumbleweeds have engulfed houses. The sight of a tumbleweed gently rolling across the earth may seem a serene one, but the truth is that tumbleweeds are no laughing matter. The sub-zero arctic storm that blew into Colorado on Monday brought with it more than just snow, below-freezing temperatures and a wicked wind chill; it also summoned an onslaught of tumbleweeds to Colorado. This isn’t the first time this has happened, either. Colorado Springs appears to be the gathering point for these prickly anomalies, as mountains of them have been blowing and accumulating on roads and even in front of peoples’ houses. They seem like nothing more than a bothersome weed, but in reality they do bring with them some dangers, including a potential fire hazard. In a drought like the one Colorado has been in recently, that’s not a good thing. This begs the question: just where do these things come from, and how do we get rid of them? Turns out, tumbleweeds aren’t indigenous to America at all. No, the Russian thistle, as it’s properly called, was brought to America by Ukrainian farmers in the late 1800s by accident. They were first discovered in South Dakota, and through the years they’ve made their way to every nook and cranny of the U.S., and now, it’s hard to imagine America without them. They are the iconic symbol of the Wild West, after all. It would be nice to not have to worry about tumbleweeds anymore, but it’s highly unlikely they’ll ever disappear. Tumbleweeds can produce up to 250,000 seeds, and as they roll along in the wind, those seeds spread. They aren’t called tumbleweeds for nothing. In spite of the dangers tumbleweeds can pose, they also have some rather interesting and useful qualities. For one, they’re edible, and have even been known to be used as a spinach substitute. The military is also cited as using tumbleweeds to soak up depleted uranium from contaminated soils at weapons testing grounds because it turns out tumbleweeds absorb radiation. Some people even harvest tumbleweeds and sell them to those creative enough to transform a tumbleweed into a decorative ornament. So, next time you stumble across a tumbleweed and want to send it on its way, make sure you don’t have any radiation that needs cleaning up in your backyard. 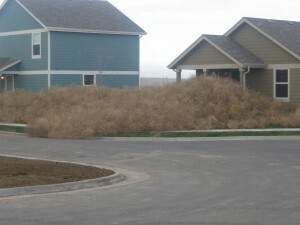 Houses smothered by tumbleweeds. A sight far to familiar to many home owners. DENVER – The 2014 winter season in Colorado began with subzero temperatures, snow and… tumbleweeds. Tumbleweeds aren’t the prettiest of plants. They are typically considered a noxious plant, associated with the old west and are thought to be useless in nature, but there are some interesting uses for tumbleweeds that most will overlook. I know what you are thinking, tumbleweed is the last thing anybody would want to eat, but it’s quite palatable when it’s still green. Also, when cooked like spinach or other greens, according to eattheweeds.com, they’re even better to eat. There have been recipes plastered across the internet that make use of the plant before its tough and formidable stage. From a simple spinach alternative to an agretti and ricotta cheesecake recipe by the modernbeet.com, tumbleweed and its plant-cousins are being used to cook meals. A person who is interested in using tumbleweed to cook can buy it at a farmer’s market or can even plant their own seeds in a home garden. Because tumbleweeds are edible, the possibilities are endless when creating that new family-recipe. On military test sites there is often heavy radiation, toxic materials and metals left behind. Scientists have determined that something had to be done and researched what would soak up the left behind Uranium the best. According to research, tumbleweed stacked up as one of the best plants, out of 150, that would rid the uranium from military sites. The better thing, when the tumbleweeds dry up and roll away, the harmful radiation is taken away from the site with no human management necessary. Sometimes a city or town cannot get rid of the tumbleweeds, so they make the best of it. In the city of Chandler, Ariz., a tradition has been made where the city builds a tumbleweed tree with nearly 1,000 tumbleweeds each year. The event includes a tree lighting ceremony, a parade of lights and is free for anybody to attend. 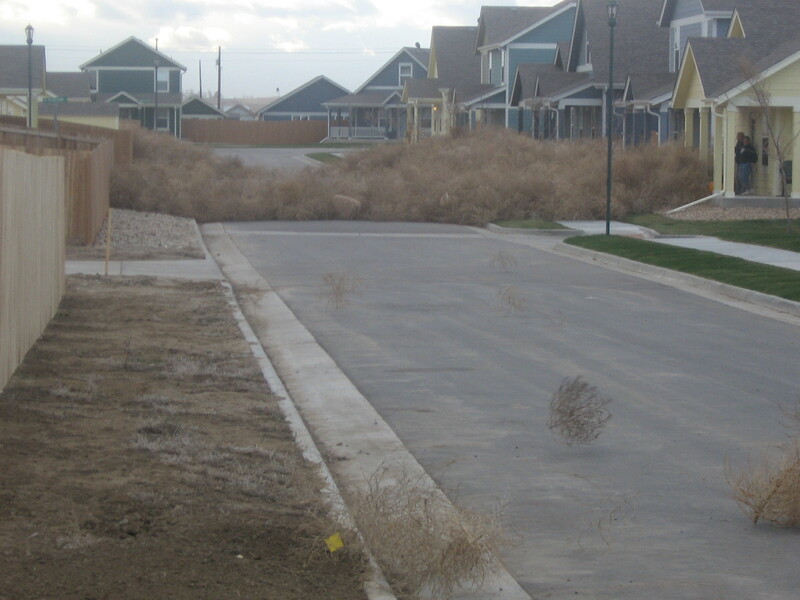 People are finding ways to make tumbleweed plants more useful. From recipe creations to Christmas trees, these plants are being used in ways nobody would consider and from the looks of it, a new use for tumbleweeds comes up each year. COLORADO SPRING, Colo. – The massive storm system that blew into Colorado on Monday morning brought cold temperatures, snow and strong winds. And in Colorado Springs, that wind brought dozens of tumbleweeds. Tumbleweeds can be any sort of dried up plant that, once matured, breaks off from its roots and tumbles away with the wind. They have collected against people’s homes, forming makeshift walls and blocking sidewalks and driveways. Colorado residents are using rakes and even snowplows to clean up these pesky, dried plants, especially because they can pose a fire hazard during dry conditions. 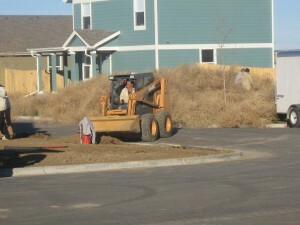 Some Colorado Springs residents are shoveling out from under tumbleweeds rather than snow. Winds caused tumbleweeds to pile up several feet high in and around Colorado Springs and Pueblo as the storm system moved into the region Monday. Colorado Springs resident Whitney Grant says, “Tumbleweeds are a familiar sight.” She was surprised to find them barricading people inside their homes and even finding their way inside buildings. She and her daughter found a straggling tumbleweed inside a local Walmart over the weekend, in the electronics aisle. Brian Paulson of Pueblo West wasn’t fazed about all the dust and tumbleweeds blowing near his home. “It happens most falls after the ground dries out and the winds pick up,” says Paulson. 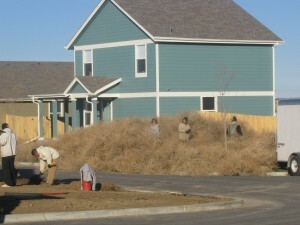 For information on cleaning up after tumbleweeds, you can contact Helping Hands at 719-246-375. Helping Hands is an ecofriendly company that helps clean up the property and takes in the tumbleweeds for recycling. 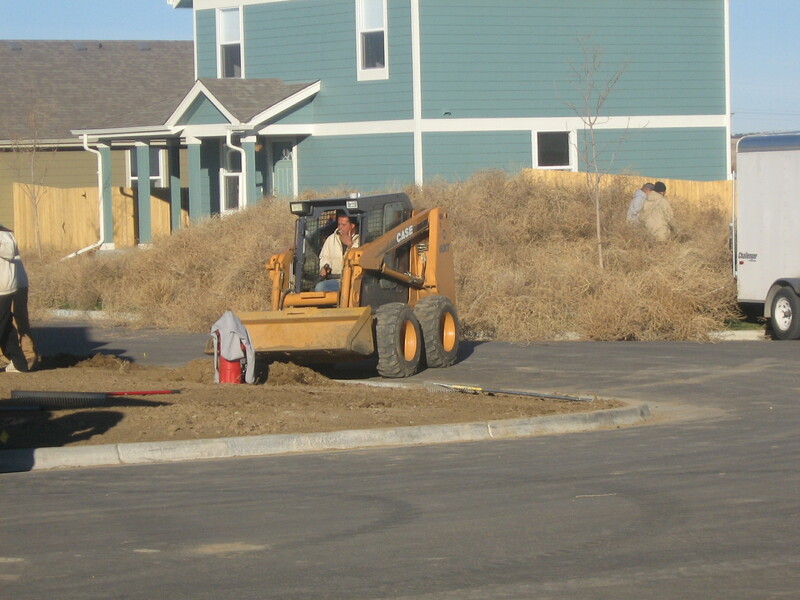 As gusty winds blow, many Coloradans find themselves shoveling tumbleweeds. DENVER- Tumbleweed season is upon us. As the gusty winds blow, we find ourselves not only shoveling snow, but also tumbleweeds. A tumbleweed is a plant that breaks away from its roots and is driven around by the wind. These plants are generally found in desert terrain. They can also range in size from a softball to the size of a car. They thrive in warm weather and grow quickly. They originated from Ukraine and were brought over by farmers. It is also known as Russian Thistle. These plants of terror are attacking the homes Coloradoans. The sudden weather change has caused these plants to break from their roots and find new homes. They disperse their seeds while being blown across the plains. Though many people see them as an annoyance, tumbleweeds are actually quite helpful to the environment. Studies have revealed that tumbling tumbleweeds soak up uranium from contaminated soils at weapon testing grounds. This weed was also made famous by The Sons of Pioneers, who wrote the song Tumbling Tumbleweeds. The song was popular in the 1940’s. While jamming out to Tumbling Tumbleweeds one can sit back and enjoy a “Tumbleweed” drink which includes Kahlua, Brandy, White Crème de Cacao, Hazelnut Liqueur and one scoop of vanilla ice cream. 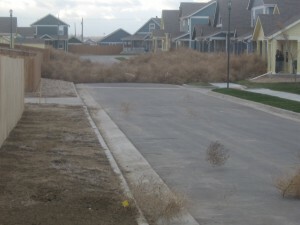 Tumbleweed season will come and go like all the other seasons. But they will undoubtedly leave their trail and back next year. When we see tumbleweeds, we think quaint country locations or comedic effect. Little do we know, tumbleweeds are fire hazards that people have been ignoring for far too long. The Western United States have large amounts of tumbleweeds that have been rolling around disturbing people’s lives by blocking roads, homes and gathering in large numbers. They have accumulated and caught in people’s fences becoming hazards. These dry ball of sticks are very flammable and in the right condition will turn into rolling balls of fire. In Mobridge, South Dakota in 1989, tumbleweeds tore across the small town and caused trouble for its citizens. The weeds blocked roads going in and out of Mobridge, buried people’s homes and cause residents to live in fear of fires. One home was even buried to its roof in tumbleweeds. The Army Corp of Engineer was called in to help the Mobridge citizens and fight the tumbling threat. Tumbleweeds needs to be taken care of before they can do any serious harm in the future. While they are a reminder and sign of a simple country life, they are still a threat, especially in large numbers. Reducing the number of these rolling menaces will make a lot of country citizens’ sleep easier at night.